Smith and Visentini shared a great interest in the designs and theories of the sixteenth-century Venetian architect Andrea Palladio, whose work they considered superior to that of later baroque architects. Smith published a reprint of Palladio’s architectural treatise, I quattro libri, in 1768. In 1743-4 he had commissioned from Canaletto a series of pictures depicting Venetian monuments, including the principal buildings of Palladio in imaginary settings. It was perhaps the combination of their interest in Palladio and the commission to Canaletto that prompted Smith to commission a series of eleven overdoor capricci of English neo-Palladian buildings. 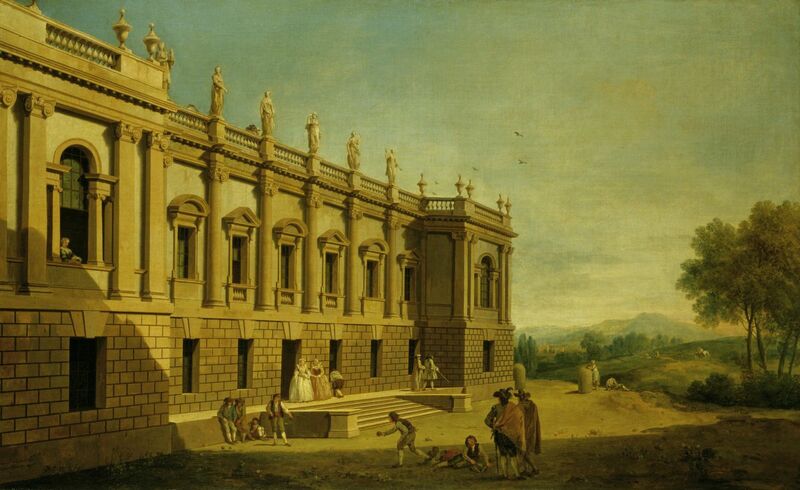 Visentini painted the buildings using volumes of British architectural engravings for reference, whilst Zuccarelli painted most of the figures and all of the landscape settings. They date from 1746 and were possibly intended as overdoors for the Consul’s villa at Mogliano, on the Venetian mainland near Treviso. Eight of the views were hung in the Entrance Hall at Buckingham House by 1819. They were moved to the Grand Corridor at Windsor Castle in 1828. Visentini’s view of Burlington House was based upon plates 234 in the third volume of Colen Campbell’s Vitruvius Britannicus, published in 1725. Burlington House was the London home of Richard Boyle, 3rd Earl of Burlington, the amateur architect who did so much to promote the neo-Palladian style in England. The new façade for Burlington House, built in 1718-19 probably to the designs of Campbell and of Burlington himself, was inspired both by Palladio’s Palazzo Porto-Colleoni at Vicenza and by the Jacobean architect Inigo Jones, whose work was in turn indebted to Palladio. In the nineteenth century Burlington House became the home of the Royal Academy and the façade was drastically remodelled.